Permission. Quite possibly the most frustrating word in a hunter’s dictionary. Not the weather, the season, or the regulations, or even the game…it’s permission. Getting access is something that strikes fear and frustration in the hearts of many hunters. Hunting land is so parceled into segments and sub-segments it is no wonder those struck with a deep sense of wanderlust exit for the West when given the chance to search for larger parcels of land rich in the game to roam. If you study history, you’ll realize a tax map of many areas around the country looks much like Europe during the age of the futile system. Whether it is just the times and everyone’s general distrust of new people or that there really isn’t enough room for everyone; perhaps the issues in some areas with deer numbers are not related to a lack of hunters, but a hunter access problem. Just knocking on doors is hit or miss. More often than not the land behind house number one is not the owner of the property. Sometimes this is the case and others it is not. Using aerial technology to your advantage can help you identify the pieces of property you want to seek permission to hunt on. This is a time-saving method to help you narrow in the handful of properties you want to target. This makes finding permission more manageable and not as daunting. When you narrow down the properties you’d like to hunt, the next big problem is finding out who owns what. Looking at all the land out there and trying to dissect the tangled web of ownership it in one sitting will leave you overwhelmed. Half the battle to gaining permission is knowing where the land owner can be found. That house planted on the side of the road with a large swath of timber behind it probably won’t be the owner. You can do things the old fashion way by getting a tax map. However, town tax maps can be difficult to read as they are typically in vague black and white photos giving you only a small snapshot of the property you want to hunt. Tracking down the correct information is an additional hassle we don’t need to put up with in the age of technology. OnXmaps is an easy-to-use platform which gives you all the information you need about property lines right on your phone or GPS. You can see in real time who owns what and where the best address to contact the owner is to give you a chance to knock on their door for permission. 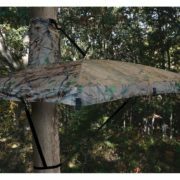 Being ethical about property boundaries is a must for hunters. However, especially in the east where land has been divided and subdivided hundreds of times over the past two hundred years of this country’s existence, who owns what property can become down-right confusing. Just looking at a map from the sky makes you shake your head. In real time you can know where you are and who owns what property with this simple phone app. There is an unnatural fear of knocking on someone’s door. It is a fact that there is apprehension and a twisting uneasiness in our stomachs every time we pull into a random driveway and head for the door. We become a blabbering mumbled mess of adrenaline. This uneasiness keeps many people from doing so. Remember to simply relax and smile and keep in the back of your mind the worst someone can say is, no. So what if they say no? It won’t be the end of the world. If you are feeling stressed out by the prospect of knocking on someone’s door remember the following tips. Deep breathing exercises can naturally help alleviate tension in your body and help you relax. Do a few deep breathing exercises help to refocus yourself and stifle an adrenaline rush. Much like taking a deep breath when shooting a bow, breathing distributes oxygen to all your vital organs in your body. A reduced heart rate and normalized pulse will keep you focused on the task at hand and also relax your tense muscles. As you are driving up to the driveway to ask for permission, Inhale and exhale in a calm manner through your nose. Take the classic method of taking a deep breath, counting to four, hold for two, counts, and then exhale. The worst someone can say is no. Quit thinking negatively. Negative thought accelerates tension and stress which can turn you into a bumbling fool. Thinking of the situation positively with no expectation and help you overcome and control subsequent panic attacks. Put yourself in the owner’s shoes. They have probably been asked dozens of times for access. Make sure to dress for success. Business casual, jeans sans the holes and mud we typically associate with outdoor wear, is appropriate. How you look when you knock on a door gives off the perception of how you will treat their land. Appearance equals the perception of respect. The time of year to ask permission also makes a big difference. Two weeks before the season is not the best time to ask. Starting in the offseason a great Way to build trust is to ask for permission for small game or predator hunting. This is fairly noninvasive and allows you a chance to get to know people. Don’t rush to ask for permission for a high-value target like deer or turkeys. Offering to regulate yourself to archery only seasons is another great way to shed any previously held stereotypes the landowner may have about hunters. 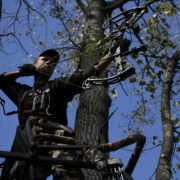 Explain the quiet and noninvasive nature of bow hunting to the land owner. Landowners who may have been left with a bad taste in their mouths from past party hunting experiences will be wary of many people wanting to hunt in groups. Positioning yourself as a solo and quiet hunter willing to help out around the farm or house can help gain the confidence of landowners. When stepping out of your comfort zone to find permission to hunt it is easy to see that many areas have such deep roots among community members, earning trust is not going to happen by simply knocking on the door. Growing trust does not happen overnight so here are a few things to do in order to help network in local communities and engage with landowners. Engaging with a complete stranger is difficult. Remember to ask the owners questions and let them talk. Take notice of things around their property, pictures and ask about it. If someone can become comfortable with you quickly there is a better chance they will let you have access. This is not a one-way road. Offer to help with chores around the property throughout the summer in exchange for access. Simple actions or offers lets people know you are serious and can be trusted. Offer to cut tails or mow, watch pets, find something to do to gain trust. Maintaining a relationship is paramount to future success. Always send a card in the offseason around the holidays or share meat from your successful hunt. Food goes a long way to winning people’s hearts and again lets people see you are of good character and are eligible for earning their trust. The one piece of property you don’t need permission on is public land. Now, when the word public land comes to mind some people automatically discount the idea based on apprehension and fear. Sure, the risk of bumping into someone is higher. However, the unnatural fear of law enforcement and unruly crowds has protected would-be dynamite hunting spots. For some people, especially if one is new to an area, to look at all public land options is the only choice. Public lands come in multiple forms more than most people realize. There is the more well-known federal ownership of lands such as wilderness and national forests, refuges then there are state game lands such as wildlife management units. Some state parks allow for activities such as bow hunting which you can learn about with a bit of research. Then there are land trusts, privately held lands open to the public through the application. These take a bit more digging to find but can have incredible results. Knowing what public land options are available are key to success. If you can compartmentalize fear of public lands, the world is your oyster. Scouting is the number one key to hunting public lands in order to build familiarity with the area but also to find out how the animals move when the pressure hits. For some, hunting public land is an afterthought. For others, it is the only choice. While some may have a fear of hunting on the public ground, there may be a day where it is gone permanently. Taking the time to learn to hunt public lands keeps a great resource for all sportsmen across the country alive. With government eyeing public lands to divest them for money, it is important to become invested in something we all own to protect it for the future. Garnering permission for hunting grounds is becoming more difficult. It takes the time to build relationships and earn the trust of landowners. Regardless if you hunt on private ground or on the public, we have a responsibility to care for the lands. Pack out what you take in. Don’t leave messes for the next person since it only hurts the chances of being invited back to hunt those private ground the next season.